This weekend is the opening of “First Man”, a movie about Neil Armstrong, the first man on the moon. So naturally our thoughts turned to Cape Canaveral (formerly called Cape Kennedy). This is the home of the John F. Kennedy Space Center and the NASA space complex from which the Apollo 11 mission launched on July 16, 1969 to put Neil Armstrong on the moon 8 days later. To this day, only 11 other men have touched foot on the moon! 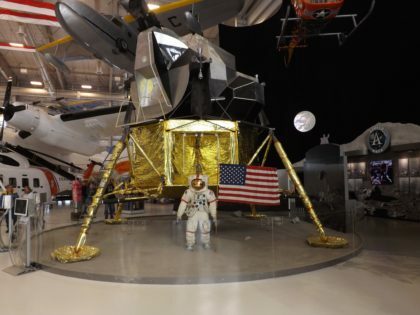 Most visitors to the area come to see the Kennedy Space Center. They have an amazing visitor center with an IMAX theatre that gets you up close and personal with space travel. You can easily spend a day or even two exploring the history and rocket garden. Time it right and you might even be able to experience a rocket launch! Be sure to look for ospreys as you drive in. There are permanent nesting platforms built on the top of poles all along the wayside. 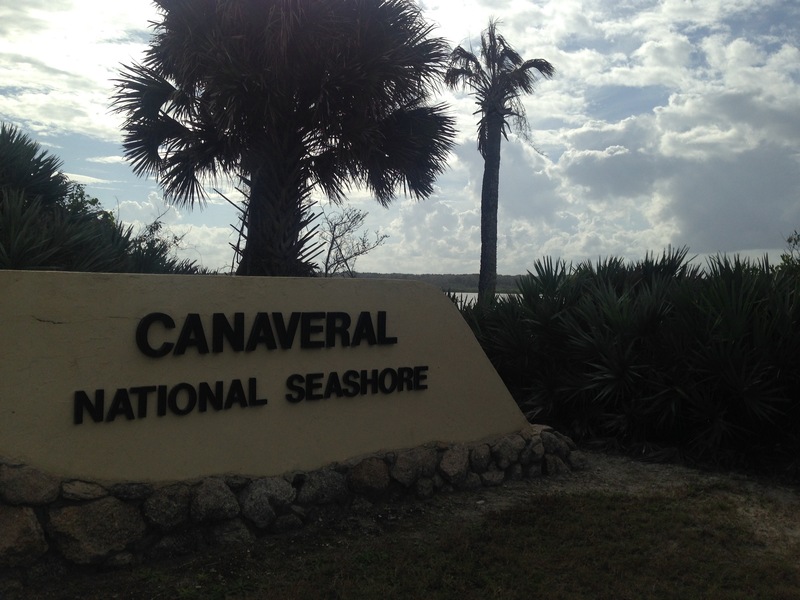 What many visitors overlook when they are in the area is Canaveral National Seashore, a barrier island originally protected to be a buffer for NASA. Since 1975, this area has been managed by the National Park Service. This hidden gem protects 24 miles of pristine, undeveloped coast along the Atlantic, encompassing 58,000 acres of barrier islands, lagoons and pine flat woods. Canaveral National Seashore is one of ten National Seashores in the National Park system. Others are Assateague Island, Cape Cod, Cape Hatteras, Cape Lookout, Cumberland Island, Fire Island, Gulf Island, Padre Island and Point Reyes. 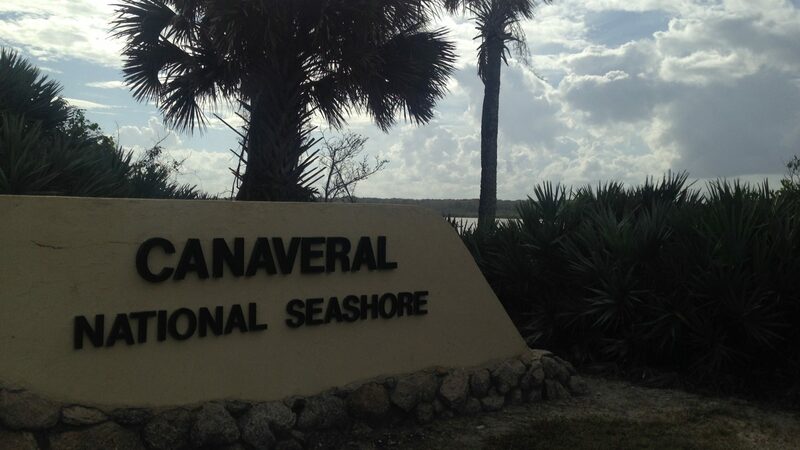 If you enjoy long windswept beaches, lush mangroves full of waterfowl, and a lagoon teeming with life, you won’t want to miss Canaveral National Seashore. 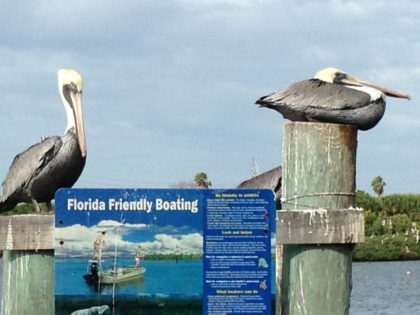 Keep your eyes open and you may see storks, egrets, ibis, blue heron, bald eagles, alligators, snakes, otters and even manatees. We even saw a manatee from shore! It was a nice slow paddle and it was really interesting to see the oyster beds; healthy reefs built by generations of oysters. The lagoon was full of life! If you like fishing, be sure to grab your rod. 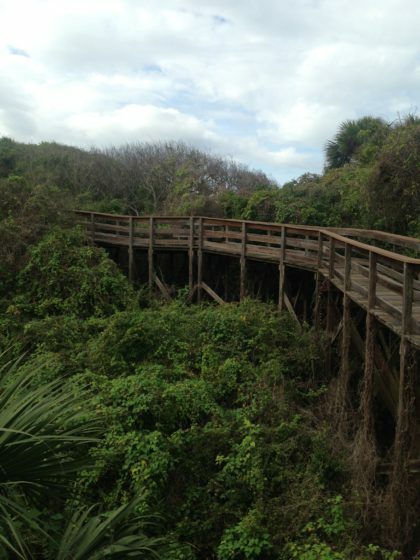 We also walked along a few of the paths through the pines and mangroves. They say there are over 1,000 plant species in the park including many subtropical plants you wouldn’t expect to see. We especially liked all the bromeliads. 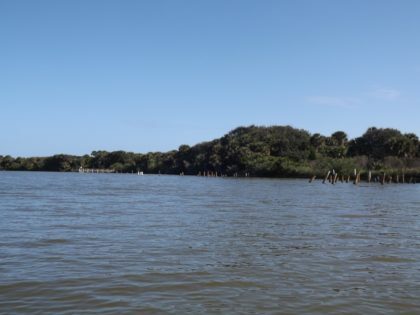 As you walk, you may come across large shell mounds – mounds of oyster and other shells, discarded by the Timucuans, residents of the area between 800 and 1400 AD. There is a long history of human habitation in this area. Of course, our favorite activity at any seashore is to walk along with beach. 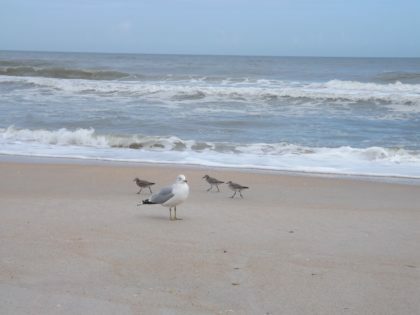 You can walk for hours on undisturbed beaches. It is gorgeous. Thank goodness the seashore is protected. As you drive to it, you will have condos on both sides of the road, right up to the gate. Then…. nothing. After leaving the beach, we wanted to experience some local cuisine so we stopped for lunch in one of the nearby towns and shared our lunch with brown pelicans. They were everywhere! It was great fun to watch them as we ate! Before you plan a visit to Canaveral National Seashore you should check the NASA launch schedule. If there is a launch planned within park operating hours, they may close the roads for safety or limit the number of people who can access the park. PreviousThanksgiving in October or November?